This is a guest blog article by Nancy A. Shenker with theONswitch. 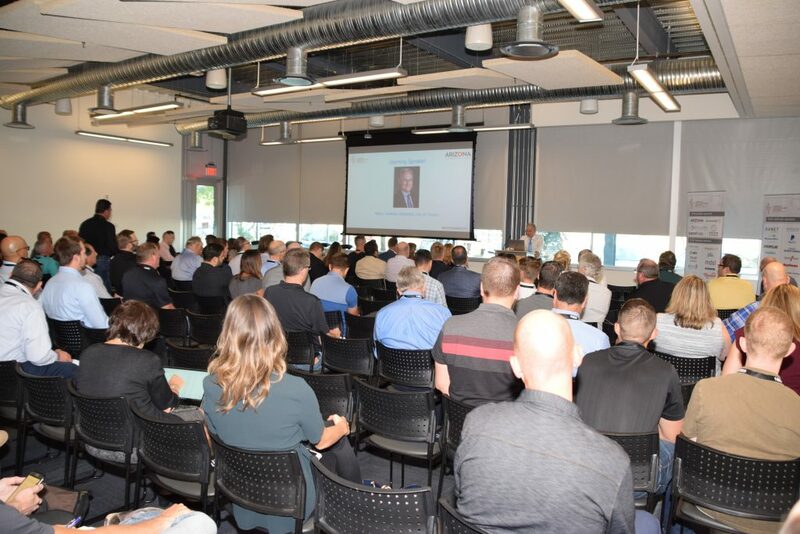 The room at ASU Skysong was as bright and connected as a row of LED street lamps as the Arizona Technology Council hosted the illuminati of the State at second annual Smart Cities and IoT Conference. More than 165 government leaders, major brand innovators, and global and local game-changers gathered to talk about how regions are applying data, IoT (the Internet of Things), and a variety of other technologies to operate more efficiently. Steve Zylstra, president & CEO of the Arizona Technology Council thanked the sponsors, kicked off the afternoon, and introduced Tucson Mayor Jonathan Rothschild who declared, “Increased efficiency is not optional for us…it’s mandatory.” He went on to say, “Any time we can do anything innovative to better serve our constituents, that’s worth of the name ‘smart.’ Partnering with other regions to share learning and resources is key, he counseled, describing how Tucson is looking at natural resources (smart meter systems, electronic billings, and water use monitoring), travel/commerce (expediting border traffic and security), and safety (fire department links to social services and police force using automated crime analysis) as just a few of the area his city has applied smart technology to improving life quality. His fact- and trend-filled presentation highlighted that by 2050, 66 percent of the population (6.4 billion residents) will live in urban areas and, by incorporating technology into their infrastructure, cities can enjoy up to $20 trillion in economic benefits. IoT technology alone will be worth $6.2 trillion by 2025 and 200 billion total IoT devices will exist by 2020. Much of the the focus is in health care and manufacturing. The cybersecurity market is also rapidly growing and will reach $1 trillion in spending by 2021. Arizona is uniquely poised to be a leader in innovation, due do its pro-innovation policies (autonomous vehicles, FinTech sandbox, 5G, ride sharing, home sharing, unmanned aircrafts, etc. ), as well as its world-class educational system focused on innovation. Since 2015, 240K new jobs have been created in the region and the State is working hard to attract more corporate tech headquarters and global business. Next, a panel of innovators shared recent developments on how Microsoft, Intel, Cisco, and Sensagrate are all creating the next generation of IoT, which will not only connect people with devices and enable devices to “speak” to each other, but also to provide the data that will effect change. 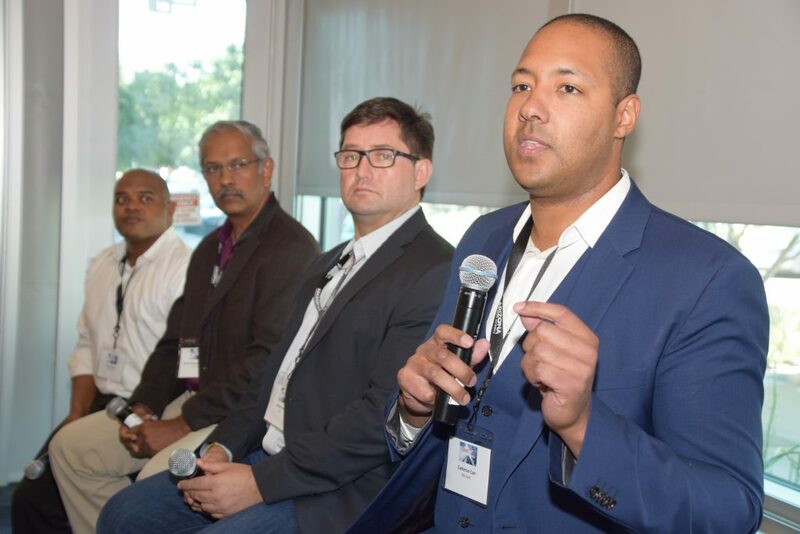 Sensors are becoming more affordable, which creates opportunities for municipalities, but the speakers stressed how cities need to be educated about the value that IoT can add and how they need to start planning for integrating the physical and digital worlds. Building on the previous panel, a group led by Chris Richardson of ASU and representing Tempe, Gilbert, and Mesa, community leaders talked about how they are assessing their internal needs, creating a vision for their regions, and collaborating among themselves and other smart cities to serve the needs of their citizens. “Cities need to work more like Amazon,” Richardson declared. Among some of the applications of technology to problem-solving are the use of data to battle the opioid crisis, sensors that allow visually-impaired people to cross streets, and open portals that build trust within the communities and enable citizens to weigh-in on critical issues. “You have to be scrappy when you work in government,” said Gilbert’s Laurie Buczek. She noted that many governments are just getting started in applying sophisticated technologies to their operations. Educating employees about process change and digitizing the workforce needs to be done to accelerate smart city initiatives. Trash pick-up scheduling (using GPS data and route optimization), ride-sharing, kid-finder systems and on-site payments for public spaces, are just some of the areas under review. How do you measure the ROI of technology initiatives? “You can’t always quantify the things you do every day. The payback may be in serving the needs of the community and long-term cost savings,” noted the panel. What’s Next? How Do We Get There? Darren Elven, Co-Founder, Chief Strategy Officer, Archethought, closed-out the day with a brief overview of how technology has evolved. He used traffic control as an example, noting that although some intersections have evolved from human “policers” to machine-powered solutions, we have a long way to go in building systems that truly work. “There is no truly smart city…we’re still getting there,” he declared. He stressed the importance of cities and municipalities owning their own light poles, because these structures can serve multiple purposes (e.g., weather sensor, LED light, Wi-Fi hot spot, camera, video display, and power charging). “When cities own their own light poles, they have much more latitude in terms of introducing new technologies.” he reinforced. We first must envision the future and then reverse-engineer to figure out what the city needs to have. Echoing the sentiments of all the speakers, he stressed the collaboration and partnership. Healthcare (including aging in place), mobility, homes, buildings, agriculture, transportation, water, and education are among the many areas that will be touched by technology. Engaging citizens and looking to other cities — locally and worldwide — builds collective intelligence. “When smart cities collaborate, they create smart regions,” he reminded us at day’s end. Clearly, Arizona, thanks to the efforts of the Arizona Technology Council and its members and partners, is well on its way to being one of those regions. Complete details about the agenda, speakers, panelists, and sponsors can be found here. The Arizona Technology Council hopes you’ll join us at an upcoming event and, if you’re not currently a member, you’ll consider getting involved. AZ Tech Council Smart Cities Recap by Nancy A. Shenker, CEO, theONswitch marketing and Inc.com contributor and Event Sponsor.